Marketing these days can be done by anyone, anywhere, at any time. Social media is one of the largest growing trends in the world, and isn’t going anywhere, anytime soon. Assuming you have some friends on Facebook, it only takes a few seconds of typing, a well worded message or image and once the likes start coming in, your message is seen by the masses within just a few minutes. Lets take a look at a few tips, tricks, and tools that might help your marketing immediately. Every time you or someone else visits Facebook you on average have 1,500 potential stories to see from all the people you follow, they follow, and then of course the advertisements. The bulk of when these posts are made are between the hours of 8am and 6pm. Lets take a look at this nifty graph by TrackMaven. 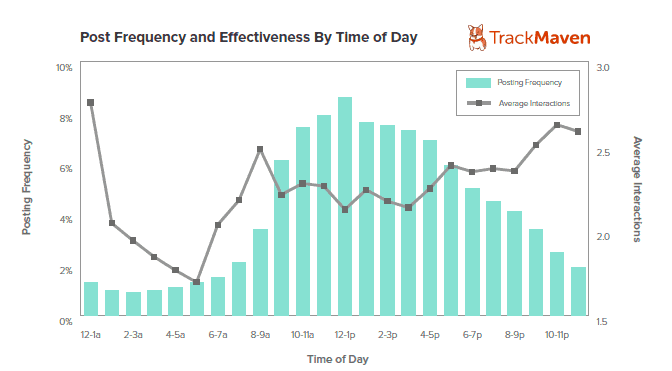 As you can see in the graph, the highest posting times don’t necessarily coincide with the largest interactions which happen the most between 10pm – 1am. So by posting your information right after the peak post times, and in the largest interaction range, you will get an increase in views. This is due to the feed slowing down, and people being able to take more time to see your post before it gets lost in the shuffle. One of the most popular types of posts on Facebook are questions! When you engage your followers with good or interesting questions, it helps stimulate conversation about your company, and in particular if you post a good story or article, then the “likes” it receives is a free ride to their feed, and onto the screens of people who are not in your circle. However, don’t go overboard as you may get blocked or un-friended if you are constantly spamming your followers with questions or articles. Be selective and post away. The Facebook News Feed algorithm takes into mind the type of update your page uses. The News Feed then places a higher value on link posts vs photos that just contain a link in the caption. This is one of the best changes you can make to the way you post. The increase that companies see in click-throughs is huge. Click the image below for more info! As you can see the reach difference is huge. Here is an example of what link posting looks like. As you can see you still get a nice large thumbnail, and when its clicked on it takes them to your story. As you can see there are a few simple changes you can make that will really impact your marketing through Facebook. Take advantage of your social media outlets and watch your business soar!